Turn your grill to medium heat. Alternatively you can use a grill pan, which should also be placed over medium heat. When the grill or grill pan is hot, grease with cooking spray. Place pineapple slices on grill and cook on each side for about 2 minutes, until grill marks appear and the pineapples have softened slightly. Transfer the pineapple slices to a cutting board and set aside until cool enough to handle. Roughly chop the pineapple and transfer them to a blender. To a small saucepan, add the 1/4 cup of sugar and 1/2 cup water. Heat over medium heat until sugar is dissolved. Immediately take off the heat and pour the simple syrup into the blender. Squeeze in the lime juice and pulse until very smooth, about 1 minute. If you like it, you can strain the mix (I didn't). 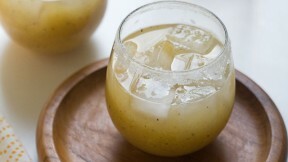 Transfer the pineapple margarita mix to the refrigerator to chill for 1 hour. In a small, shallow bowl, mix the reserved tablespoon of sugar and salt. Rub the rim of each glass with a wedge of lime. Roll the rim in the sugar and salt mixture. To each glass, pour in an ounce or two of tequila, an ounce of Cointreau and then top with the pineapple mix; stir until combined and serve!